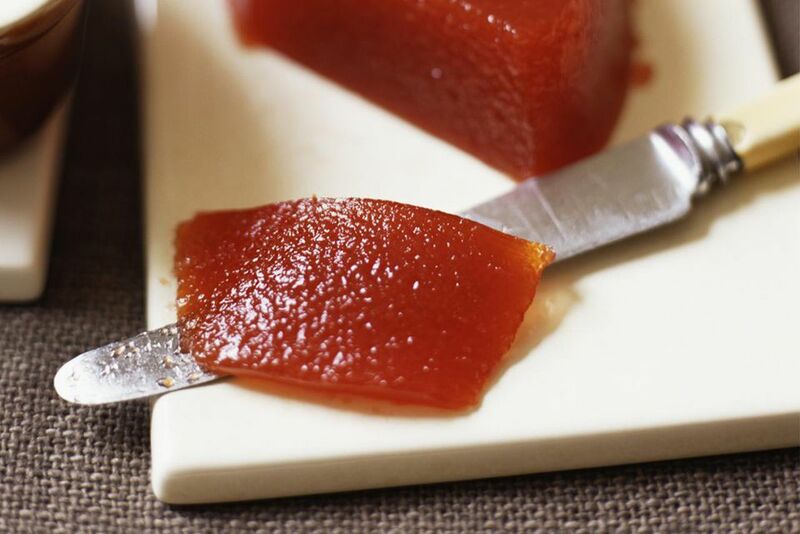 Quince paste, called membrillo in Spain, is a tangy-sweet fruit preserve. It is fantastic served with cheese (manchego cheese is traditional), but also makes an excellent breakfast spread. There are two ways to make quince paste; one starts from scratch and the other uses the quince mash left over from making quince jelly. They both yield the same tasty result. To make quince paste from scratch, wash and peel the quinces, reserving the peels. Core the quinces, adding the cores to the reserved peels. Chop the remaining quince into approximately 2-inch chunks. Tie the peels and cores up in cheesecloth or in a clean muslin bag. Put the chunks of quince and the bundle of peels and cores into a large pot. Add water to cover by approximately 1 inch. Bring to a boil over high heat. Reduce heat and simmer for 1 to 1 1/2 hours until the quince chunks are mushy-soft. Remove and discard the bundle of peels and cores. Strain the remaining cooked quince through a very fine-meshed strainer or a double layer of cheesecloth set in a colander (you can use the liquid that strains out to make quince jelly). Leave the quince to strain for 2 hours. Puree the strained quince mash in a food processor or run through a food mill. Weigh or measure the puree then put it in a large pot. Add an equal amount by weight or volume of granulated sugar (by weight is better). Cook over low heat until very thick, approximately 1 1/2 hours. Stir constantly at first to dissolve the sugar, frequently after that. When it is done the quince paste will stick to a wooden spoon, and if you drag the spoon over the bottom of the pot it will leave a trail that does not fill in immediately with the quince. Be careful at the end of the cooking time to stir often and not let it burn. Lightly grease a 9-inch baking dish. Spread the quince paste in the dish smoothing it out with the back of a spoon. It should be about 1 1/2-inches thick. Let the paste cool in the baking dish. Dry the paste in your oven at the lowest setting, not higher than 125 F/52 C. If your oven doesn't go this low, prop its door open with a dishtowel or the handle of a wooden spoon. Alternatively, remove all but the bottom tray from your dehydrator. Place the baking dish of quince paste on the bottom tray and set the temperature to 125 F/52 C.
Dry the quince paste for 8 hours or overnight. The surface should be glossy and not sticky to the touch. Put the baking dish of quince paste into the refrigerator for 4 hours. Run a knife around the edges of the paste. Invert the quince paste onto a plate. Wrap in plastic wrap and store in the refrigerator for up to 3 months. After making quince jelly, you'll have a bunch of strained quince mash with the peels included. Run this through a food mill to remove the peels. Skip the first 5 steps above and proceed from step 6.